We’d love your help. Let us know what’s wrong with this preview of The Return of Zita the Spacegirl by Ben Hatke. To ask other readers questions about The Return of Zita the Spacegirl, please sign up. What a fun way to round out the trilogy! After the huge Legends of Zita the Spacegirl cliffhanger I’ve been keen to know where we’d find Zita at the beginning of this story. Zita is on trial in the Court of Dungeon World, facing a slew of trumped up charges; her heroics in the first two graphic novels twisted into crimes. Poor Mouse appears at her kangaroo court and, shackled in a way that brought to mind Hannibal Lector, he’s been sentenced to death! But wait! Who or what is that mysterious cr What a fun way to round out the trilogy! After the huge Legends of Zita the Spacegirl cliffhanger I’ve been keen to know where we’d find Zita at the beginning of this story. Zita is on trial in the Court of Dungeon World, facing a slew of trumped up charges; her heroics in the first two graphic novels twisted into crimes. Poor Mouse appears at her kangaroo court and, shackled in a way that brought to mind Hannibal Lector, he’s been sentenced to death! But wait! Who or what is that mysterious creature in the blue cape that’s overlooking the proceedings? Bringing back all of my favourites from the first two books and introducing a few new ones, this is the action packed volume that finally answers the question of whether Zita ever returns home to Earth. I don’t think I’d return if I were her because of all of the amazing adventures she’s had and the wonderful friends she’s met along the way, but it’s what she’s dreamed of since the beginning so I couldn’t help cheering her on. What’s lovely about this story is that you don’t just get to witness Zita saving a friend, an enemy or a world; Zita needs help herself in this one. Thankfully she’s made such an impact previously that there’s no shortage of people/beings/objects willing to lend a hand or whatever is needed to contribute to saving her. Femur and Raggy, Zita’s dungeon mates, were the comic relief for me and became new favourites. I also loved that previous favourites including One, Strong-Strong, Randy and Shippy returned. Like the two previous Zita books the illustrations in this one were brilliant. Although the story could end with this book and currently does, there is potential to keep the story going. While you could argue that this series presents a good case for quit while you’re ahead I’d keep reading if another Zita book magically appeared in front of me. In what I’ll call the Special Features after Zita’s journey concludes (I’ve been bingeing a lot of TV series recently) there’s a beautiful story of how she came to be. It’s one of those melty heart stories that makes you appreciate Zita even more. 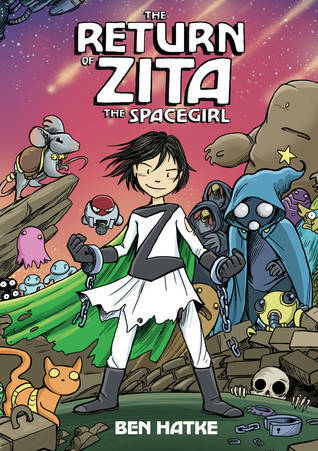 This is the last volume of Ben Hatke's Zita the Spacegirl trilogy. We agree that Zita is awesome! And this book certainly does end on an . . . interesting note. But right now, there are not any plans for future Zita volumes. We have an amazing picture book coming out from Ben in the fall -- it's called _Julia's House for Lost Creatures_ -- and another graphic novel for This is the last volume of Ben Hatke's Zita the Spacegirl trilogy. But right now, there are not any plans for future Zita volumes. We have an amazing picture book coming out from Ben in the fall -- it's called _Julia's House for Lost Creatures_ -- and another graphic novel for kids coming late next year (it's going to be wonderful, you guys!). Wonderful end to an amazing trilogy. I highly recommend these books. Zita's origin story comes to an end with this volume, though there's plenty of room for further adventures. As with the other two, this book is full of well-rounded characters, intergalactic adventures, real-life emotions surrounding not-real-life conundrums, and wonderful creatures on every page. It's the ending that particularly charmed me, making me say, "Good for you, girl. Take charge of your own destiny!" It's pretty empowering and I wish I'd have had this in my hands when I was 8-years-old. THE RETURN OF ZITA THE SPACEGIRL is the third and final Zita graphic novel (for now). Zita has saved many people and multiple worlds since leaving Earth to rescue her classmate Joseph. She's also made enemies, which has led to her being thrown into a terrible underground prison. The Zita series is extremely popular for a good reason. The books have a lot of sci-fi action, colorful and creative character design, and an intrepid heroine determined to save the day. I really enjoyed how THE RETURN OF THE RETURN OF ZITA THE SPACEGIRL is the third and final Zita graphic novel (for now). Zita has saved many people and multiple worlds since leaving Earth to rescue her classmate Joseph. She's also made enemies, which has led to her being thrown into a terrible underground prison. The Zita series is extremely popular for a good reason. The books have a lot of sci-fi action, colorful and creative character design, and an intrepid heroine determined to save the day. I really enjoyed how THE RETURN OF ZITA THE SPACEGIRL brought back old characters, such as Piper and Madrigal, and introduced new ones, such as Zita's hilarious cellmates. It also has a strong theme of unintended consequences in addition to the usual selfless heroism. I think THE RETURN OF ZITA THE SPACEGIRL can be enjoyed alone, but it's best if you're familiar with the characters. Each of the novels is a pretty quick read, so there's no reason not to read the first two. Ben Hatke's Zita trilogy combines the appeal of Raina Telgemeier or Matt Phelan's art with a science fiction story reminiscent of Bruce Coville. Zita's back, hooray!! I just love Ben Hatke's characters. There are some delightful new ones in here, and of course all of our old favorites. He is SO GOOD at comic action -- every frame is filled with color and movement and excitement, and you just cannot put down the story and leave it. Well done, as always. Gah, I really love this little superhero. The world Hatke has created throughout this series is filled with all sorts of adorable aliens, quirky robots, and very loyal friends. Fingers crossed that Zita and her comrades have another adventure sometime soon! that's how you learn, just who you are"
Zita has been captured and is facing the consequences of her crime, as well as some trumped up charges that suit the Dungeon Lord's purpose of keeping her locked up. However, Zita is far from beaten. She refuses to give into Dungeon Lord and when a mysterious "ghost" tries to help her, but demands she not stop to help others she refuses him too. Zita is determined to save Mouse and help the people of Dungeon World! Fortunately, she has outside help on their way as even Spacegirl heroes need a li Zita has been captured and is facing the consequences of her crime, as well as some trumped up charges that suit the Dungeon Lord's purpose of keeping her locked up. However, Zita is far from beaten. She refuses to give into Dungeon Lord and when a mysterious "ghost" tries to help her, but demands she not stop to help others she refuses him too. Zita is determined to save Mouse and help the people of Dungeon World! Fortunately, she has outside help on their way as even Spacegirl heroes need a little help. An epic ending for this series of Zita (hopefully we get more eventually!) as she faces her past decisions, makes even more new friends and receives support from past friends too! Again, the artwork is spot-on, the story fantastic and the characters likeable! Share and enjoy! Content issues: No language or sensuality issues. The Dungeon Lord has laser-gauntlet things that he likes to zap people with, mostly just to torture them and seems to cause pain, but not death (though pretty sure he does kill people/robots with them too in one scene; it isn't graphic); some brawling/fist violence and a space battle, as well as a planet imploding, but injuries are minimal and not graphically depicted. Sadly, the tales of Zita's adventures in space have come to a close. The final book in a beautiful graphic novel trilogy, The Return of Zita the Sapcegirl picks up where the last book left off. We find Zita trapped in an asteroid prison because all the good she did as Zita the Spacegirl had some repercussions that might not have been all good. Awaiting trial for her crimes of goodness, Zita and her pals learn that the prison warden is planning to dominate the galaxy-- starting with Earth! The thi Sadly, the tales of Zita's adventures in space have come to a close. The final book in a beautiful graphic novel trilogy, The Return of Zita the Sapcegirl picks up where the last book left off. We find Zita trapped in an asteroid prison because all the good she did as Zita the Spacegirl had some repercussions that might not have been all good. Awaiting trial for her crimes of goodness, Zita and her pals learn that the prison warden is planning to dominate the galaxy-- starting with Earth! The third volume did a beautiful job bringing together all the elements of the previous books. We revisit favorite characters, explore their personalities more, and even get to know some new characters. Yet, this volume follows some heavier themes than in the past. Zita is losing heart in prison, and is beginning to doubt herself. The theme of doing the right thing in the face of adversity is strong here. It would be easy for Zita to take the easy road out to only save herself. She has learned over the course of these books that all her actions have had reactions. Zita has learned that she has been naïve. A good portion of this book explores this idea, along with the blurred lines between right and wrong, as well as good and evil. While the characters, art, and themes are amazing, this book fell a bit flat for me. I felt like the story was a little troupe, and after the beautiful and brilliant colors of the first two volumes the darker tone of this book was a bit jarring. I think it was appropriate for the story, but it left me a little down. Even the uplifting moments, [spoiler] like when Zita is drowning in despair and her Strong Strong star breaks into pieces, letting her friends know that she is alive and needs their help [/spoiler] weren't as uplifting as previously. I found the cute or funny moments to be more spread out. It was just a bit disappointing. I do love how open ended Hatke left the final book. The ending was abrupt, and a bit sad. [spoiler] Poor Zita and Joseph didn't get to say goodbye to their friends, or even to see if they were okay. It was now or never-- and they made the sacrifice to leave. Heartbreaking. [/spoiler] Hatke said he was done with Zita, but this ending will easily allow him to jump back into her world with little effort. As many of my bookish friends have also said, I really hope some day he does pursue this. Zita's world is magical and I will always want to revisit it. Zita is on a penal planet, charged with sundry crimes based on her heroic exploits. More new interesting life forms, more adventure, more doing what she thinks is right regardless of the cost. Zita just gets better with each volume. I love this series so much - it raises the bar for kids comics. Still pretty heartbroken he's stopping at three with Zita. Definitely just cried at the end of Zita. Zita is held prisoner by a despotic ruler who wants to use her portal button to take over Earth. Aided by a skeleton, a pile of rags and a friend from the past, Zita tries to overcome the ruler's evil plans. You may have picked up that I skipped book two in the series, Legends of Zita the Spacegirl, because the library didn't have it (boo!). This wasn't too much of a drama because the opening scenes cleverly work some of the key points from books one and two into the dialogue between Zita and her captor. Yes, this book begins with Zita imprisoned and seemingly helpless, although it is apparent that in book two she had been gadding about making a name for herself across the galaxy and fostering the reputation of someone not to be trifled with. The plot focuses on Zita's attempts to escape her prison by finding a jump crystal with which she can power up the red-button thingy and take herself back home. Along the way she is helped out by a mysterious masked boy and her cellmates, a skeleton named Femur who possesses some very interestingly shaped digits, and Ragpile, an animated pile of rags. I absolutely loved the little twist at the end concerning Ragpile and Femur and it encapsulates the ingenuity and humour that is woven into these stories. Old friends also make an appearance, including Pizzicato, Strong-Strong and One, as well as some folk from the second book who I hadn't met before, most interesting of which being a space-pirate type lady and her mysterious cat. 4.5 stars. Other than a weirdly gendered comment in the middle about a boy not understanding women, I loved this a whole lot. Same as the other ones. I wish there were twelve more, but also it was so perfect the way it was. How do they just keep getting better. So much fun. One of the best graphic novels for kids I've read in a long time... I would read 100 volumes of this just for the creatures. I will first talk about the stuff that is spoiler-free, after that I will review the rest in spoiler tags, as that is needed. I don't want to spoil the epic stuff in this book. So, be warned, read the spoilers at your own risk! They are big spoilers, but I need to review the book, and thus some things will have to be spoiler tagged. First up, Zita. Ah, I loved her in the first and second books, but in this book we see a Zita who will never give up, who will fight, who won't give up hope even when everything seems so hopeless. She is strong, determined, even more so then in the previous books. Now for all the spoiler stuff! Don't read this unless you really, really read this book!!!!!!! (view spoiler)[OMG, Joseph! I never expected to see him again. Like Zita, I expected him to be home, on Earth, and not wandering around the world they are now. But apparently things didn't go right and he was stranded on a bad planet. I didn't particularly like Joseph, and I don't think I ever will. While Zita is strong and determined, he is pretty much a wuss and afraid of a lot of things. Instead of stopping and trying to save people/aliens, he goes on. Not wanting to waste a moment on saving someone. I can imagine why he thought that, and why he does that, but at least give it a chance. It might end in failure, but at least you can say that you tried. That you did your best. The whole "betrayal" stuff? With how Joseph was, I thought it was actually true. He really betrayed her! But then it turned out it was all a ruse. The whole stuff that happened in the dungeon and mines was really interesting and it gave the story extra dimension. And once again, Zita is touching people's hearts. Making them love her and making them try to help her out. The ending? I loved it! I guess, we aren't done with Zita. I guess, Ben Hatke will be writing another story someday, at least I am hoping this, it would be a shame if he didn't after making this ending. A great finale and an all too short trilogy. I wish we could see more of Zita and Joseph and all Zita's friends! The ending made me smile! On another episode of Zita the Spacegirl, we discover that Zita is in prison in a planet that is difficult for anyone to locate her. It has been rumored this prison planet existed but never discovered. Zita is guilty on all charges from stealing the space ship and luckily this masked hero helps her almost escape. While she was almost out of prison, she discovers there is a creature that is supposed to be floating in space and instead is chained up and its power is being drained. She wants to hel On another episode of Zita the Spacegirl, we discover that Zita is in prison in a planet that is difficult for anyone to locate her. It has been rumored this prison planet existed but never discovered. Zita is guilty on all charges from stealing the space ship and luckily this masked hero helps her almost escape. While she was almost out of prison, she discovers there is a creature that is supposed to be floating in space and instead is chained up and its power is being drained. She wants to help rescue it but fails at first and learns that the creature is the one who is keeping this planet stable. The alien who is in charge of this prison is trying to find a crystal to transport his species and him to another planet to conquer and after analyzing her blood, he now wants to reach Earth and take control of it. While he strips Zita of her outfit to make her look like a peasant, they made the bad mistake of ripping her star that her friend gave to her. By ripping it apart, it sent a signal to all her friends and together they find her location and decide to bail her out. Over the course of the story, we get this big epic battle scenes of escape, and attacking the guards and all the evil people and Zita and her friends save the day. We get to learn that the masked hero who helped her escaped is none other than Joseph who she thought was on Earth. In the first book they were about to go home when the crystal shattered sending only one of them in the portal and for Joseph, the portal to Earth became several portals and he ended up on another planet. Now that they saved everyone, Zita and Joseph was about to escape the ruined planet with the bad guy ruined their opportunity. He fights them and finally throws them down to plummet to their deaths. Zita friends couldn't reach her on time to save her so instead Piper attaches the portal to the robot and he projects the portal for Zita and Joseph to return to Earth before they plummet to their death. Piper was successful and quickly the portal closes. Now that Zita and Joseph have returned home, it seems like they were gone only for a few minutes while its been days since they were in the other galaxy (Similar to Narnia). While Joseph is glad to be home, Zita misses her friends and her adventures and tries to contact them for a year to see them again. A year goes by and nothing until she sees that her robot friend has crashed landed on earth with a note written by Piper saying that they need Zita's help leaving it open for another volume. I should say that I have not read the earlier Zita books, and that well could have affected my enjoyment of this, the third book in the series. Judging this volume completely on its own, though, and I found that it was a fun and charming read, a light story with some heavier and darker elements and enough plot twists and interesting characters to keep things moving along nicely. The action was solid, the plot complex enough while drawing from elements from previous volumes in what I can assume is a satisfying manner, and it all worked rather well. It's cute and fun and worth a read. The action started off with Zita captured on a prison world, and while this might have been something picked up from the end of the last volume, it might not be. Having not read it, I can't be sure, but I wasn't lost. The concept of Zita the Spacegirl, adventurer and hero of the stars, is one that can pretty easily be understood, and it was something where she's basically on trial because some of her good actions had some consequences she didn't really think about. And that makes sense, both as she is a rather rash person and because she is young. It's all part of the villain's plan to claim Earth, and it makes sense. Imprisoned and doubted herself, Zita still manages to be heroic, helping who she can. When rescue comes from an old friend, though, the real message of the volume comes into greater focus. It's a classic argument that if she had had different experiences when she arrived she would care less about helping people. Basically that being kind and saving people is a luxury that she could afford, but that it's rather naive. And the volume does a good job exploring that idea and making it clear that trying to do the right thing is always important even in the face of defeat and destruction. Cozy ending that kind of promise a continuation! Thanks NetGalley for the read! I thought the spatial art for this volume was done beautifully. I’ve loved Zita from the very beginning as this spunky heroine adjusts quickly to space life and decides to help others and make friends. Showing the sparse bleak landscape of this dungeon world fit beautifully into Zita trying to escape (and not lose hope) in her biggest challenge, yet. The secondary characters that she meets are HILARIOUS!~ Hatke takes the usual trope of prison scenery and turns a “d Thanks NetGalley for the read! I thought the spatial art for this volume was done beautifully. I’ve loved Zita from the very beginning as this spunky heroine adjusts quickly to space life and decides to help others and make friends. Showing the sparse bleak landscape of this dungeon world fit beautifully into Zita trying to escape (and not lose hope) in her biggest challenge, yet. The secondary characters that she meets are HILARIOUS!~ Hatke takes the usual trope of prison scenery and turns a “dead skeleton and weird rag blob” bursting full of cooped up charm and motviational coaching attempts. I found it interesting that the ‘rock’ creatures resembles the Susuwatari (soot sprites) from Miyazaki’s Spirited Away and My Neighbor Totoro. After making that connection, I was instantly whining about how they need to stop mining. I felt like I better could relate to Hermione's cause of freeing the house elves. Let’s get back to the appeal of Zita. The stylish art with its bright cluster of creatures and colors would win everyone over. Readers will get a sense of ‘wrapped’ closure to this story arc, and hopefully we see more future stories of Zita. Side Note: This is one of my most POPULAR series in my youth services department. The kids will definitely be delighted to go on another adventure, and while this pace was a bit leisurely written, it won't distill from the enjoyment of it. It was really neat to find out the backstory of how Zita was modeled from his wife AND one of Zita’s first appearances was in the book Flight. LOVE FLIGHT. That little tidbit and the sketches included completely thrilled the fangirl side of me. Until we meet again, Zita! My eight year old daughter and I are both huge Zita fans, so we were very excited to get an arc of this third installment in the saga. We were not disappointed - The Return of Zita is arguably the best the series and develops the story with new depth while tying up all the plot threads. All the elements that made the first two books so entertaining are still here - the satire, appealing characters and wonderful melange of alien species, worlds and gadgets (I have been using doorpaste as a plot d My eight year old daughter and I are both huge Zita fans, so we were very excited to get an arc of this third installment in the saga. We were not disappointed - The Return of Zita is arguably the best the series and develops the story with new depth while tying up all the plot threads. All the elements that made the first two books so entertaining are still here - the satire, appealing characters and wonderful melange of alien species, worlds and gadgets (I have been using doorpaste as a plot device in lots of my drama classes). But from the first page the stakes are raised and the dramatic tension is far higher than in the previous two books. Zita is on trial for her life and the world she has found herself in is much darker than anything we have seen before. For the first time in the saga I was worried that main characters would die and felt genuine chills when the villains made their appearances. This darker feel is reflected in the illustrations which use a slightly more muted palette for most scenes but are as expressive and detailed as any fan could hope for. Ben Hatke's artwork is consistently masterful, deceptively simple in style but beautifully composed and with an ability to capture every emotion of his endearing characters. My daughter sat and read this in one sitting; I don't think I've ever seen her so gripped by a story she's read herself. While she enjoyed the first two books, she was happy to read them in short bursts. This was different - it was completely absorbing. I loved the ending, as it resolved the story while leaving it open for potential future adventures. The section at the end explaining the origins of Zita was an unexpected bonus. Although I still really enjoyed this third Zita volume, especially because Ben Hatke's art just continues to improve, it came to my attention that Zita isn't very developed or unique as a protagonist. While I'm thrilled that she's a cool girl who goes on adventures, I realized that, in many ways, she's the bland main character you see in shonen manga (think Naruto, or Goku): good-hearted, persistent, loyal and impulsive, but not particularly clever, whose real "magic" power is her ability to mak Although I still really enjoyed this third Zita volume, especially because Ben Hatke's art just continues to improve, it came to my attention that Zita isn't very developed or unique as a protagonist. While I'm thrilled that she's a cool girl who goes on adventures, I realized that, in many ways, she's the bland main character you see in shonen manga (think Naruto, or Goku): good-hearted, persistent, loyal and impulsive, but not particularly clever, whose real "magic" power is her ability to make friends and galvanize then into helping her, and doing what's right. Don't get me wrong, that's a pretty awesome power, but I get tired of intentionally bland characters who allow for reader self-insertion. Also, I think that Hatke missed an opportunity to address the fact that, although Zita ended up saving to planets in the previous books, she didn't think. Although the villain of the story points this out, no credence is given to this sentiment, since he's the villain. I think that it would've been a good lesson for kids to learn, that even if you have good intentions, and even if things come out "right" in the end, that there are multiple ways to view things, and sometimes your actions, especially impulsive ones, have unintended consequences. My favorite in the series. The tone was darker and the story felt stronger, which was pleasant for a conclusion. I appreciated Zita's personality and decisions in this volume, more than in the previous ones, she really cared about others and was resourceful. The supportive cast was wide and interesting, adding humor and friendship to the volume. 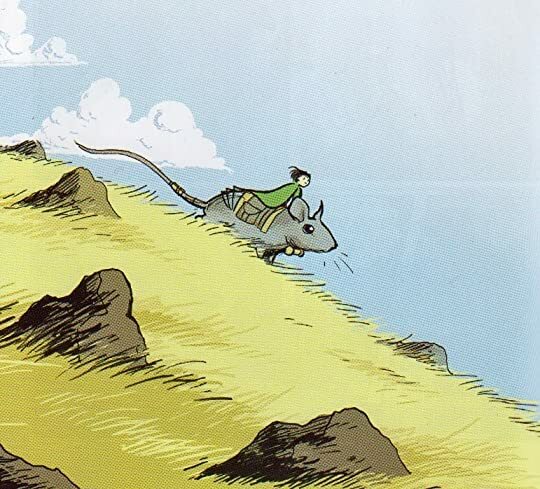 More light-heated action and adventure in children's graphic novels. Volume 2 and volume 3 are more connected to each other than the first one to them. Though volume 2 does round off its story before we learn how things will continue. Spoilers ahead, to be sure, for volume 1 and 2. Return takes up from the cliff-hanger ending of Legends. At first with a mysterious masked figure darting about a mystery structure. All becomes clear, however, as he watches Zita's trial. Not only for stealing a spaces More light-heated action and adventure in children's graphic novels. Return takes up from the cliff-hanger ending of Legends. At first with a mysterious masked figure darting about a mystery structure. All becomes clear, however, as he watches Zita's trial. Not only for stealing a spaceship, but for associating with known criminals. The figure tries to rescue her, but fails, and they strip her off all she owns and drop her in a cell. One of them tears up her star -- which proceeds to float out the vent -- and into space.